This is not a piece that is for or against the repeal of Obamacare (and its replacement) by the Republican plan, whatever that looks like once it gets out of Congress (if it does). Instead, here are some simple questions that, whatever side you are on, demand answers. That being said, Obamacare or even better, the Affordable Care Act or ACA, does need fixing. The bill initially was intended to be a start, not a final solution. What did the law really do? Was it about healthcare and insurance, or something else entirely? 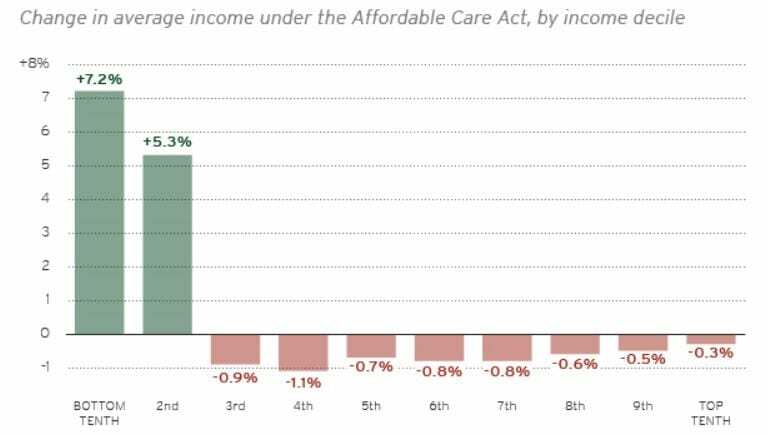 The ACA was really about one thing: the redistribution of wealth. The taxes that were part of the bill took funding from the top 80% of wage earners and provided it as subsidies to the lower 20% of wage earners. (You can read more about that here in this report from Gary Burtless and Henry Aaron of the Brookings Institution). One could argue, as the editors of Vox do, that that was really the purpose of the bill, to redistribute wealth, something most conservatives believe is immoral. Since the subsidies are based on income, many believe this disincentivizes those in the lower 20% from wanting to move up in income, much like the opinion of other entitlement programs. The other issue is those on the cusp, on the imaginary income line between the bottom 20% or the top 80%. They may not have quite enough income to realistically afford health care from the exchange or on their own, and might not yet be covered by an employer for whatever reason. Especially in the states where there was not a medicare expansion (31 states adopted it, the rest did not), this middle group was hit particularly hard, and is where many of the ACA horror stories come from. So what is the real question here? Is the redistribution of wealth immoral, and why or why not? If we do not engage in the redistribution of wealth through government healthcare subsidies, how should we work to reform healthcare? Is an open market the answer? Is the redistribution of wealth immoral, and why or why not? In the old west, an era where one doctor might visit several towns, and modern medicine was in its infancy, waiting days for any kind of healthcare was not uncommon. If the doctor was actually competent and not a drunk, you might live if he got to you in time and actually had the medicine you needed. If the doctor was actually competent and not a drunk, you might live if he got to you in time and actually had the medicine you needed. We as a nation often invest thousands, even millions, ensuring that those in third world countries or compromised by war or terrorism have access to medical care. In this way we consider it a basic human right: but what is access? In the United States, almost anyone technically has access. If a person is in critical condition, no medical facility will turn them away. But do they get the same kind of care, regardless of their insurance and what they can afford? Studies say no. So does the inability to afford reasonable care count as a hindrance to access? That’s the real question: how do we define access? Just because you can walk into a doctor’s office does not mean you can afford to stay or afford the care offered. Is affordability of care, like the bartering of the old west, a basic human right? Is the Open Market Really Open? Finally, if the open market and competition is the answer to driving costs down, we have to look at if the market is really filled with enough competition to make that true. If the insurance companies collaborate on costs if drug manufacturers have a monopoly on a certain drug, is there really competition that will undercut their prices, and really offer customers a choice? This is often tough to answer. In many rural areas in states such as Idaho and Wyoming, only one insurance provider has a network that covers that area. The residents are not left with a choice: they go with the provider that will cover them, regardless of cost. Since these areas are also often low-income, patients must choose a high deductible plan or no plan at all. Self-insuring for most is a gamble at best. All they are really doing is betting they won’t get sick. One Emergency Room visit will wipe out even the most robust Health Savings Account. Cancer? Forget about it. Even the tools for comparing insurance costs are, at least at the moment, tied to the ACA. Google had an insurance comparison tool but shut it down in large part because there were not enough participants for it to make money, and the information is available elsewhere, on state healthcare exchange websites and healthcare.gov. For the self-employed, there are some group plans, and writers and artists can use resources like Freelancer’s Union to buy into group plans. However, there are few real choices when it comes to good insurance coverage, and prices tend to vary in similar ways. For the market to really expand, we need new companies, more insurance choices, not less. So is the market truly an open market? Is there enough competition to drive costs down? Before Obamacare things were broken. How will the marketplace be reshaped by this new plan? There are other questions about the Republican alternative to the ACA. How will it be funded? How will spending less in subsidies provide better coverage for more Americans? Should government be involved in this process at all? Are there promises Republicans have made that they cannot keep? Will the bill even get passed with all of the disagreement in the party? I agree with many: the ACA was not a perfect solution, and clearly needs some repair. Past presidents have had different approaches to healthcare. The Republican plan as currently proposed seems to disagree with some of what they promised during the campaign. There are way more questions this early than there are answers. And I am interested in your opinion. What do you think? What are your answers? Let me know in the comments below.